Over the past 50+ years, Vaughn Industries has worked hard to become a top contractor in the industries that we serve and is dedicated to providing our customers with the most exceptional work. With more and more people realizing the benefits of renewable energy and eco-friendly resources, green energy construction has become one of our most significant areas of concentration. To date, Vaughn’s has constructed over 200 MW or renewable energy installations throughout the United States. Vaughn Industries has helped develop many projects across the United States, allowing power demands to be met by using a renewable power source versus conventional methods. 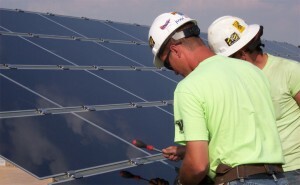 We offer photovoltaic installations to residential, commercial, and utility customers. From 1 kilowatt to the multi-megawatt size projects, Vaughn Industries can handle projects of any size. There are several different ways to generate renewable energy, and some types work better than others in various parts of the world (both financially and productively). After our experienced installers complete a proper site assessment, Vaughn Industries will provide you with all of the information needed to decide which type of renewable energy will work best for your needs. Whether your company is interested in energy-efficient and sustainable alternatives like photovoltaic, wind, solar thermal, bio-digester, or gasification, Vaughn Industries will give you the information and the resources needed to make renewable energy work for you.